In one of those ironies of personal history, I never met Linda Godfrey although we lived not far from one another and shared a great many common interests. I’m not sure she would return the sentiment, but while I lived at Nashotah House many odd things happened. Academics can be pretty deep in denial about what they experience, and although I never saw any man-wolves, as I stood outside one night to photograph a comet I felt terribly exposed and in not a little danger. This was on a rural seminary campus. Nashotah was still wooded then, before evangelical shaving of the landscape, and certainly among the most gothic of seminaries I’ve ever seen. Meanwhile Linda Godfrey was researching, just a few miles down the road, weird animal sightings on Bray Road. I began a correspondence with her after we left Wisconsin and I have read all of her books. Local history has always fascinated me, and although I was an accidental Wisconsonite, I nevertheless enjoyed learning about the strangeness of the state I formerly called home. 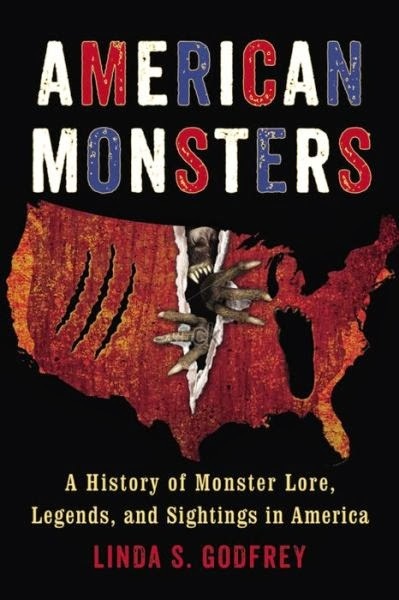 Godfrey’s latest book, American Monsters: A History of Monster Lore, Legends, and Sightings in America, throws a wider net. We are all in here with the monsters. Blending, as the subtitle suggests, lore and legends with eyewitness accounts, American Monsters can leave the reader a little disoriented, in a good way. We’ve been taught to discount anything that doesn’t match the everyday—what boss wants a worker with a higher vision?—and pretend that such things don’t exist. Weird creatures don’t donate their bodies to science readily, and we are left wondering if something is really peering at us from these October woods. Inside you’ll find stories of flying, swimming, and running monsters. We are safe nowhere. Either from the scientifically undocumented or from those that are purely imaginary. I stand outside in the dark in a smallish town waiting for a bus. What was that sound behind me? Monsters are only now beginning to gain academic respectability. When I was in graduate school the topic felt so puerile that no respectable Ph.D. candidate would dare suggest such a dissertation to a button-down committee. Now they are beginning to roll off the presses. As part of the religious imagination, monsters are not so easily dismissed. We can assign them to the dark caverns of fantasy and under-stimulated imagination, but they will burst out in their own time and, like gods, demand our devotion. I have no idea whether these cryptids creep, flap, or swish around in our world. People see them all the same. And believing may be seeing. I’m glad for Godfrey’s success at pointing out that our rational world is full of monsters. Hers is a perfect book for days of effacing light and lengthening shadows, all across the country. This entry was posted in Animals, Books, Monsters, Popular Culture, Posts and tagged American Monsters, Beast of Bray Road, Linda Godfrey, Monsters, Nashotah House, paranormal, Wisconsin by Steve Wiggins. Bookmark the permalink.